Whether you’re a small Full Service lab or a large Portrait/Social Imager, the Chromira 5x 30 can meet your digital print production needs with high production and state-of-the-art image quality. ZBE’s WorkStream Imaging Automation and Order Management software offers a comprehensive array of the packaging and compositing products you need to offer your customers a variety of image options. At 25” per minute, it easily produces 313 square feet of stunning prints per hour. The Chromira 5x 30 is a roll-to-roll digital printer. It handles any material width up to 30” and any length up to 275’. It produces dazzling digital images in print sizes of 30” x continuous. It efficiently scales image files on-the-fly to any desired print size. The Chromira 5x 30 uses state-of-the-art, award-winning, patented LED technology to create beautiful, high quality prints. It images on any RA-4 media and surface, including backlit display films. This printer delivers its productivity benefits of productivity via ZBE’s “bottleneck-free technology”, providing full front-end printer access to every computer on your network. In addition, ZBE’s WorkStream IA and Chromira Workstation software applications offer a powerful suite of image management tools, on-the-fly image processing and order management for a printing workflow that no other digital printer can achieve. The Chromira’s 300 PPI working resolution is the highest standard image resolution in the industry. To attain even higher image quality, Chromira utilizes ZBE’s patented Resolution Enhancement Technology, which achieves a visual resolution of 425 PPI. While other digital printers (such as leading laser printers) must image at lower resolutions of 200 PPI to reach production speeds; the Chromira 5x 30 production speed always runs with the highest resolution. 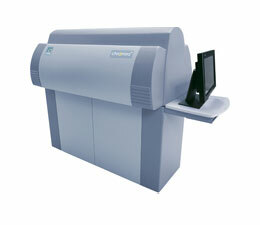 The Chromira 5x 30 provides labs competitive advantages in workflow productivity, reliability and operational ease. This is the standard in affordability and overall cost of ownership. First generation Chromira 30” printers can be upgraded to gain 5x speed. Produces digital images in print sizes of 30” x continuous. Handles any material width up to 30” and any length up to 275’. Material Size: Roll to Roll in any width up to 30”, and any length up to 275’. Print Sizes: 30” x continuous. Image files are scaled on-the-fly to any desired print size. Physical: 64″ L x 36″ W x 60″ H (162cm x 91cm x 152cm). Access required on 3 sides, desirable on all 4. Will fit through 30″ (76cm) door, by removing top of cabinet. Weight: 715lbs. (324Kg). Print Speed: 25″ (40.6 cm) per minute for 30″ paper, depending on file size and degree of enlargement or reduction. Image scaling, rotation & color balancing performed “on-the-fly” while printing. Equals: 313 square feet per hour. This equates to: 563 – 8”x10” (20.3 x 25.4 cm) prints; or 273 – 11”x14” (27.9 x 35.6 cm) prints; or 75 – 20”x24” (50.8 x 61 cm) prints per hour from 30” material.